Complete our Donation Form and then email or mail to the CBI office. Via telephone by using your credit card contact the CBI executive office at (831) 624-2015. We accept Visa & MasterCard. Thank you! Your thoughtful gift will be promptly acknowledged in our Shofar Newsletter and to the person(s) indicated. Good News! Tax-Free Gifts from IRA Accounts Have Been Reauthorized! Congress has reauthorized legislation that allows donors to make charitable gifts from their IRA accounts (including Roth IRAs) without incurring income tax on the withdrawal. It was passed as part of the Emergency Stabilization Act of 2008. If you are age 70 ½ or older and are required to take minimum withdrawals and you do not need them for personal use, this may be a great way to make a gift to CBI or pay your Temple Dues. While you cannot claim a charitable deduction for IRA gifts, you will not pay income tax on the amount. Without this law change, withdrawals from IRAs for charitable gifts are taxable to the donor. Your tax-free gift may be a payment of existing dues, pledge or a new gift. For the current tax year, you must act before December 31. This information has been prepared for general information only. You should consult a licensed or appropriately authorized financial advisor before making any financial decision. When you shop at Smile.Amazon.com, Amazon will donate to CBI. 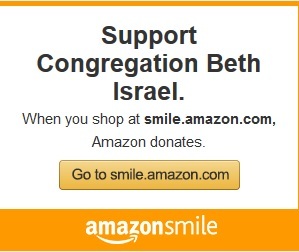 Please go shop and support Congregation Beth Israel Carmel! What if CBI earned a penny every time you searched the Internet? Or how about if a percentage of every purchase you made online went to support our cause? Well, now it can! GoodShop.com is a new online shopping mall which donates up to 37 percent of each purchase to your favorite cause! Hundreds of great stores including Amazon, Target, Gap, Best Buy, ebay, Macy’s and Barnes & Noble have teamed up with GoodShop and every time you place an order, you’ll be supporting your favorite cause. Just go to www.goodsearch.com or www.goodshop.com and be sure to enter Congregation Beth Israel – Carmel, CA as the charity you want to support. And be sure to spread the word!